Ivory and purple violets print tee shirt. Short sleeve, bodice is lined in a white jersey knit and closes in the back with a snap closure. Also included are the lilac knit capris with an elastic waistband. Doll is not included. Yellow and pink rose bud print tee shirt. Short sleeve, bodice is lined in a white jersey knit and closes in the back with a snap closure. Also included are the jade green knit capris with an elastic waistband. Doll is not included. Lavender floral print keyhole style tee shirt, short sleeve, lined in a white jersey knit and closes in the back with a snap closure. Also included are the purple jersey knit capris with an elastic waistband and matching socks. Doll is not included. This top will fit the small, medium and large bust dolls, it is being modeled by my large bust Symphony. Blue floral print keyhole style tee shirt, short sleeve, lined in a white jersey knit and closes in the back with a snap closure. Also included are the blue jersey knit capris with an elastic waistband and matching socks. Doll is not included. 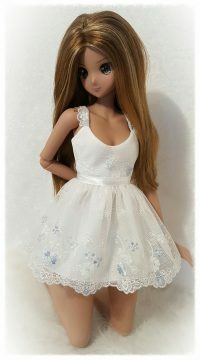 This top will fit the small, medium and large bust dolls, it is being modeled by my large bust Symphony. Sweet white summer lace top with pale blue and white embroidery. Adorned around the waist with a white satin ribbon, top is fully lined in a white bridal cotton and closes in the back with two snap closures. Also included are the blue floral knit shorts with an elastic waistband. Doll is not included. New for Spring or Summer Tie Dye pastel print tee shirt, short sleeve, bodice is lined in white and closes in the back with a snap closure. Also included are the pale blue jersey knit capris with an elastic waistband. Doll is not included. Sweet pink and white embroidered lace top, fully lined in a pale pink bridal cotton, adorned around the waist with a pink satin ribbon and bow, this top closes in the back with two snap closures. Also included are the pale pink jersey knit leggings and pink dot socks. Doll is not included. This casual spring or summer top is done in a blue floral print jersey knit. The bodice is lined in white and closes in the back with a snap closure. Also included are the lavender jersey knit leggings with an elastic waistband. Doll is not included. Pink rose bud tee shirt, short sleeve, bodice is lined in white and closes in the back with a snap closure. Also included are the pink jersey knit leggings with an elastic waistband. Doll is not included. White leopard jersey knit long tank top, can be worn as a dress or top, closes in the back with a snap closure. Also included are the matching french cut bikini bottoms trimmed in a white picot lace. Doll is not included. $22.50, includes u.s. shipping and tracking. All other countries please contact me for shipping rates. New for your Smart Doll. 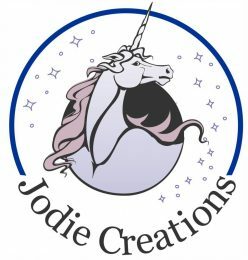 White jersey knit crop top with Jodie Creations logo on the front. Top is short sleeve, lined in white and has a snap closure on the back. Also included are the white denim stretch short shorts with an elastic waistband. Doll is not included. $22.50, include u.s. shipping and tracking. All other countries please contact me for shipping rates. Gray and white stripe crop top and shorts. Top is short sleeve, lined in white and has a snap closure on the back. Also included are the matching short shorts with an elastic waistband. Doll is not included. White a pink floral jersey knit crop top and shorts. Short sleeve, lined in white and closes in the back with a snap closure, includes matching short shorts with an elastic waistband. Doll is not included. White with humming birds print, jersey knit crop top and shorts. Short sleeve, lined in white and closes in the back with a snap closure, short shorts are a white stretch denim with an elastic waistband. Doll is not not included. White a blue floral jersey knit crop top and shorts. Short sleeve, lined in white and closes in the back with a snap closure, includes matching short shorts with an elastic waistband. Doll is not included. White jersey knit tee shirt for those against bullying and discrimination. No Hate. Top is lined in a white, short sleeve and has a snap closure on the back. Doll is not included. $18.00, includes u.s. shipping and tracking. All other countries please contact me for shipping rates. Tired of winter? This sweet floral denim set will bring some summer into your life. Created with a white stretch denim with floral print. Corset is lined in white cotton and closes in the back with snap closures. The matching capris have an elastic waistband and slide on and off the doll. Doll is not included. Warm and cozy and a touch of summer. This set includes the pale blue knit top with mid length sleeves, the bodice is lined in white and closes in the back with a snap closure. White denim floral print capris with an elastic waistband for easy on and off. Doll is not included. 28.50, includes u.s. shipping and tracking. All other countries please contact me for shipping rates. Gray Mickey mouse print top with mid length sleeves, the bodice is lined in white and closes in the back with a snap closure. Off white, pink and black Mickey silhouette capris with an elastic waistband. Doll is not included. Lace up warm and cozy top and leggings. Note: This top will fit small, medium and Large bust dolls. Created in a pink rose thermal knit fabric, top is adorned on the front with silver eyelets and a pink satin ribbon, bodice is lined in a white jersey knit, mid-length sleeves and closes in the back with a snap closure. Also included are the lavender multi colored heart and stars print leggings with an elastic waistband. Doll is not included. Bring in the New Year with this sparkly silver knit sweater top and silver leggings. Top is long sleeve, lined in white and closes in the back with a snap closure, leggings were created with a silver lycra and have an elastic waistband. Doll is not included. So Warm and Cozy. This set includes the white, pink and gray thermal knit, long sleeve shirt, shirt is lined in white and closes in the back with a snap closure, white knee length leggings, with an elastic waistband and matching socks. Doll is not included.